A U.S. 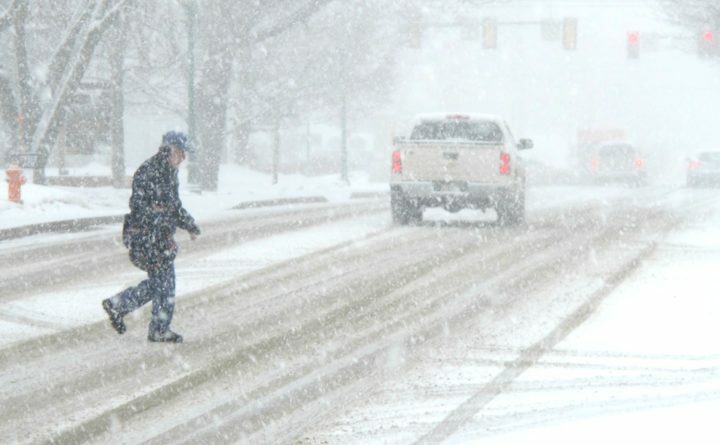 Postal Service carrier walks through falling snow on March 13, 2018 as he crosses Main Street in downtown Ellsworth. Despite the official arrival of spring on Tuesday, coastal Maine could get up to 6 inches of more snow Wednesday night and Thursday as the fourth nor'easter this month hits the Northeast. Coastal Maine could get another few inches of snow in the next couple of days as another nor’easter passes out to sea from the mid-Atlantic region and then curves northward toward Nova Scotia. Predictions vary about how much snow might fall, but generally more is expected along the coast, especially in eastern Maine, and less is expected further inland. Meteorologists predict that coastal areas could get 1 to 6 inches of snow from late Wednesday through Thursday, with possibly more than 6 inches along the coast east of Mount Desert Island. Inland areas — including Lewiston, Augusta and Bangor — could get 1 to 3 inches. Further west and north, areas approaching the mountains and in Aroostook County are expected to get roughly an inch or less. How much snow falls in Maine depends on the track of the storm. Less snow could result if it veers to the east, but inch counts could be a little higher if it tracks further west. The National Weather Service has issued a winter storm advisory for coastal Maine, where gusty winds could complicate the Thursday morning commute. The weather service estimates that Hancock and Washington counties could get between 4 and 6 inches, while sections along the immediate coast in midcoast and southern Maine could get 2 to 4 inches. Wind gusts as high as 45 mph along the eastern coast could cause power outages, the weather service wrote in the advisory. The advisory for the midcoast and southern coast will be in effect from 7 p.m. Wednesday to 11 a.m. Thursday. Along the eastern coast, the advisory will be in effect from 2 a.m. to 4 p.m. Thursday. The weather service also warned that two feet of storm surge is expected to cause minor coastal flooding along the southern Maine coast when high tide crests around 2:45 a.m. Thursday. The storm would be the fourth nor’easter to affect Maine this month, though its impact is expected to be less severe than the other three. The state’s southern coast was battered by high winds during a March 2 storm that passed primarily south of Maine, knocking out power to a few thousand electricity customers. The storm surge was aggravated by peak monthly tides that caused flooding in York and Cumberland counties. On March 8, more than a foot of snow fell in many parts of the state as another storm caused power outages for 30,000 Mainers. Less than a week later, a third storm dumped more than a foot on nearly of all of Maine, with several areas getting two feet or more. This month has been snowier than usual in Maine, as has this winter in general, but current snowfall totals trail well behind record accumulations in the state. So far this month, Bangor has gotten more than 32 inches of snow, which is about 24 inches more than normal for this point in March. The snowiest March ever in Bangor was in 1956, when it got 41.5 inches of snow, according to National Weather Service records. So far this winter, Bangor has gotten 108.5 inches of snow, which is nearly 50 inches more than normal compared to prior winters. The most snow Bangor ever got in one winter was just shy of 182 inches in 1962-63. Parts of eastern Washington County got nearly 200 inches of snow in the winter of 2014-15. Portland has gotten more than 31 inches of snow this month, which is 22 inches more than normal. The record snowfall total for March in Portland was set in 1993 with 49 inches, according to the National Weather Service. This winter, Portland has gotten nearly 90 inches of snow, or 34 inches more than normal. James Brown, a meteorologist in the weather service’s office in Gray, said Wednesday that Portland’s snowiest winter on record was in 1970-71, when it got 141 inches of snow. Ranked 10th on that same list is the winter of 1898-99, when Portland got 115 inches. “We’re not in the top 10 [for Portland], and probably won’t be this winter, given the time of year,” Brown said.